We at Niner are big fans of the Road Less Traveled. Making independent choices is how we were founded and is how we approach the future. It is with this philosophy that we created our newest effort. Is it a 29er? A monster-cross machine? A gravel ginder? Yes. Whether you ride drop bars or flats, skinny tires or something a bit more rotund, it all depends on where you want to go. The RLT 9 doesn't define you by where you have been, but encourages you to become someone new, to take the left turn and to leave the constraints of the yellow lines behind. The first Niner designed for both 29 and 700C wheels. * Run narrower wheels and tires for brief journeys away from the beaten path, try something bigger for places where terrain is uncertain but adventure is guaranteed. 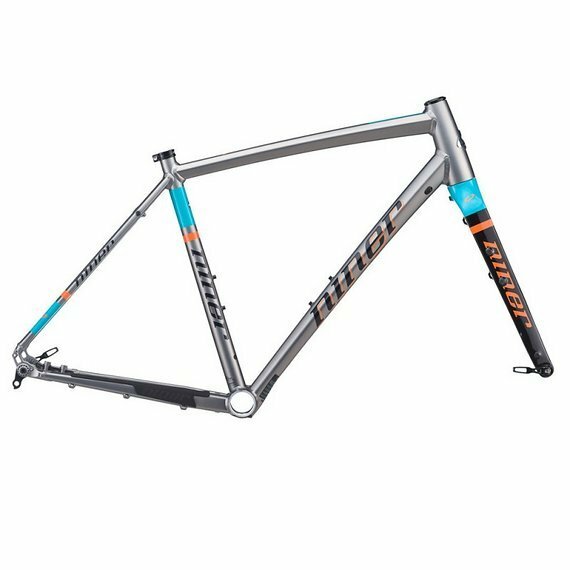 Designed with a tube set similar to the proven AIR 9, the RLT 9?s tube shapes are shaped to meet Niner?s ride quality standards. Even riders who prefer the company of saguaros to the cacophony of crowds appreciate comfort and low weight. Proprietary forged dropouts are designed to reduce weight and integrate the low-profile post brake mount with the chainstay. 27.2 mm seatpost reduces road vibrations on gravel or chip seal roads and reduces body fatigue on all-day rides. When paired with the RDO Seatpost (designed for twice the flex of traditional carbon posts), fatigue is reduced even further. Niner makes the best off road rigid forks in the world and now we bring this experience to dirt roads everywhere. The RLT 9 frameset continues our award winning ways with a full carbon, gravel-tuned and custom painted Niner Carbon Fork. All Niner forks and frames are tested to mountain bike safety standards. Full cable housing keeps the grit out of your shifting system in the nastiest conditions. Cables enter the down tube behind the head tube and exit below the BB for easy set up and low maintenance, and when you?re ready, we?ve integrated Di2 compatibility with a seatpost wiring port. The standard PF30 bottom bracket shell offers both geared and singlespeed compatibility using the new BioCentric 30. Sometimes simplicity is the key to a triumphant journey, sometimes you need a bit of help from your (granny gear) friends. Slightly longer CS, lower BB, Slacker HT angle are ideal for a stable ride on the rockiest of roads and still capable of winning a proper cross or 2 for the privateer.